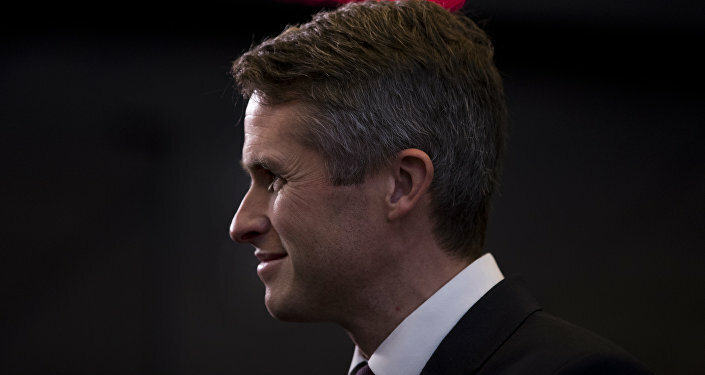 MOSCOW (Sputnik) - Lindsey German, the convener of London-based Stop the War Coalition, a group campaigning against what it believes are unjust wars, criticized UK Defence Secretary Gavin Williamson on Monday for deliberately increasing warmongering rhetoric that could further escalate tensions internationally. "Gavin Williamson’s latest Churchill tribute act would be laughable were it not so dangerous. His speech today is a deliberate ramping up of warmongering rhetoric which belies the reality of Britain’s military record and which can only increase tensions in an already dangerous world," Lindsey German said in a statement, which described Williamson as "divorced from reality." She criticized the minister's argument that the West should be ready to "use hard power" to support its interests and that the United Kingdom should increase the "mass and lethality" of its armed forces. "It is quite incredible that he fails to address the consequences of past ‘mass and lethality’ of British hard power. The last decade has seen catastrophic and unpopular invasions and occupation in Afghanistan and Iraq, a bombing campaign in Libya which only exacerbated the conditions there, the continued bombing of Syria and Iraq," German pointed out. Describing the United Kingdom's military role as "a hangover from its imperial past," German stressed that the country needed a foreign policy that would promote peace and that "tells the truth about Britain’s recent interventions." The statement comes after Williamson made a speech at a defence think tank earlier in the day, in which he said that the United Kingdom should redefine itself after Brexit as a global power ready to intervene against "adversaries" that undermine the rules-based international order. Williamson said in his address that the United Kingdom would soon have nine new Poseidon P-8 maritime patrol aircraft that would enable it to "patrol thousands of miles of ocean and greatly enhancing our anti-submarine and maritime capability."